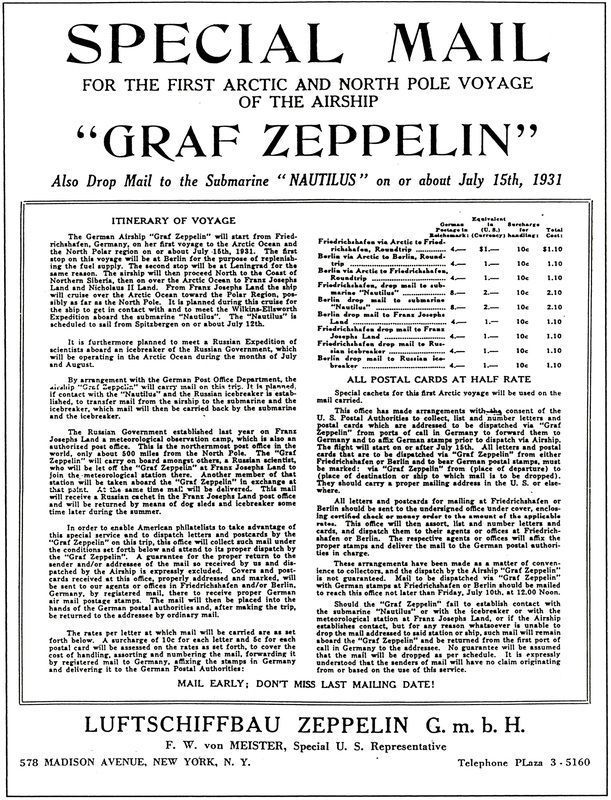 I've begin mounting my collection of Zeppelin items, and I thought I'd share here. Scans of mail items open to higher-res images. Scans of cancels don't. First, the 1. 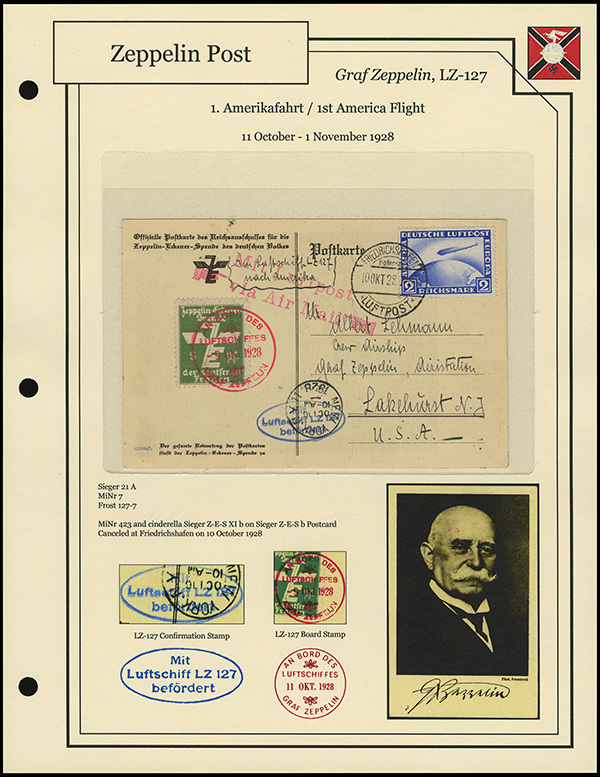 Amerikafahrt (1st America Flight), 11 October - 1 November 1928. 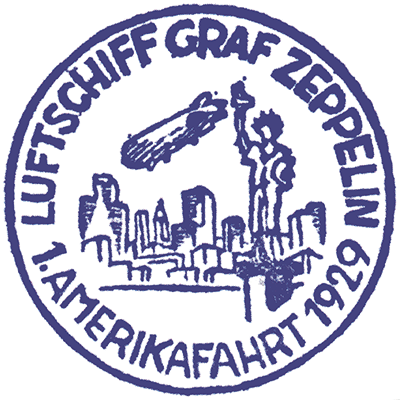 On 11 October 1928, the Graf Zeppelin (LZ-127) departed Friedrichshafen for Lakehurst, NJ, on its first America Flight. 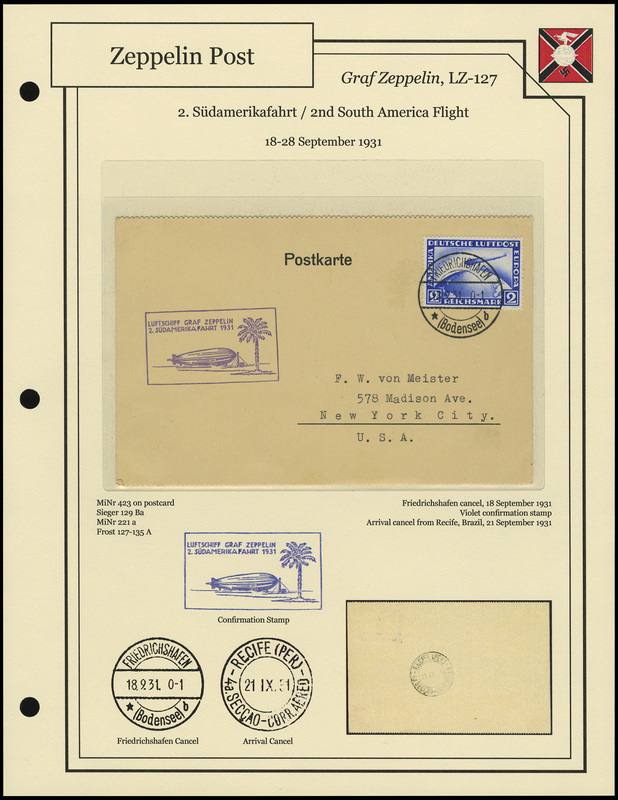 It arrived on 15 October 1928, and remained until 29 October 1928, when it departed on its return flight. 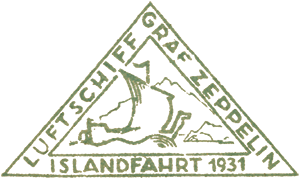 It arrived back in Friedrichshafen on 1 November 1928. 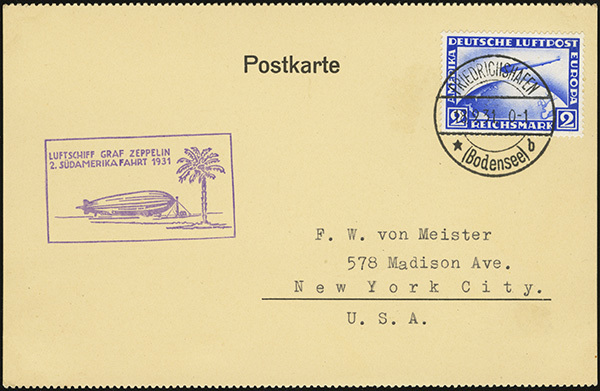 Mail from Germany can commonly be found with the 1928 Zeppelin airmail stamps (MiNr 423 & 424), as they were released less than 2 weeks prior to the flight's departure. As of this date, the Graf Zeppelin did not yet have an on-board post office, so all mail was cancelled prior to being loaded. For mail on the Germany to Lakehurst leg, this was often the Graf Zeppelin‘s home in Germany, Friedrichshafen. Mail on the Germany to America leg should have a confirmation stamp (Bestätigungsstempel) in blue, violet, green, or red, and sometimes has a board stamp (Bordstempel) in red. This is a Zeppelin-Eckener-Spende fundraising postcard (Sieger Z-E-S b) containing stamp MiNr 423 and a Zeppelin-Eckener-Spende cinderella, Sieger Z-E-S XI b (more on the Zeppelin-Eckener-Spende in a future post!). 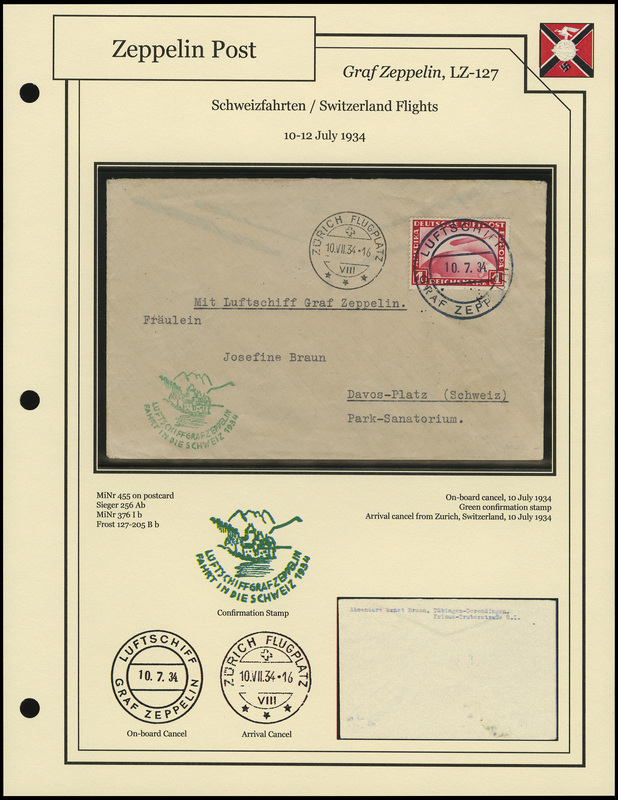 It was canceled at Friedrichshafen, and carries both the confirmation and board stamps. It catalogs as Sieger 21 A, Michel 7, and Frost 127-7. Here it is mounted in the album. 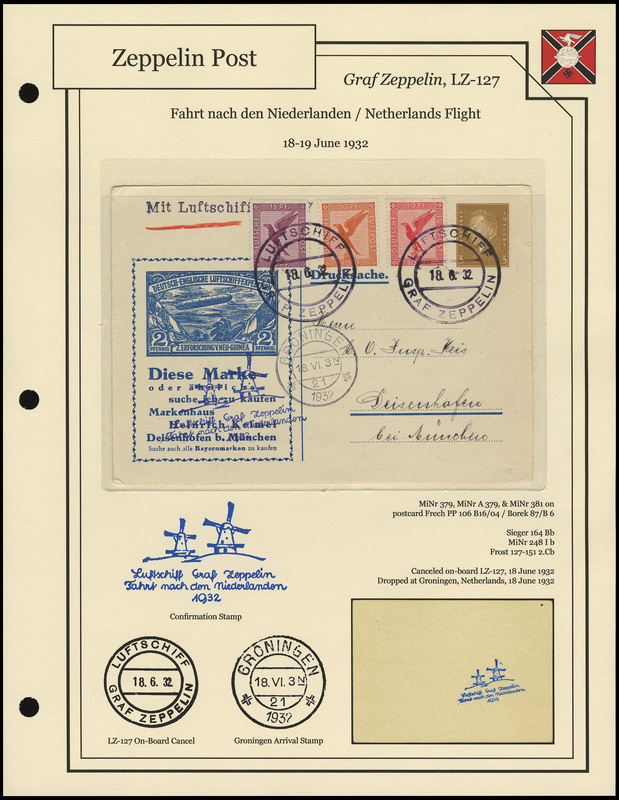 Next up, the 1930 Fahrt nach den Niederlanden (Flight to the Netherlands). 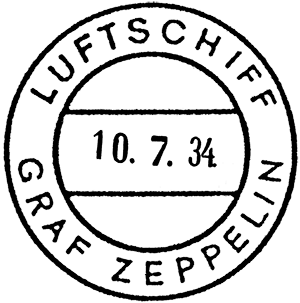 On 11 November 1930, the Graf Zeppelin (LZ-127) flew from Friedrichshafen to the Netherlands, then returned the same day. Most outbound received either a Friedrichshafen or On-Board cancel. 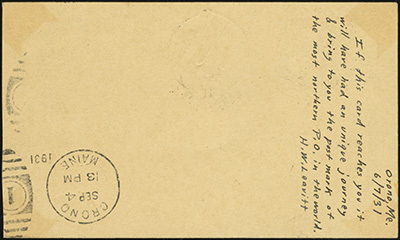 Bordpost cancel is an example from a later flight. 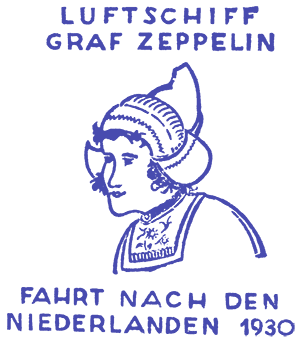 All mail transported received a blue confirmation stamp. In the Netherlands, mail was dropped at Venlo, receiving a violet arrival stamp. 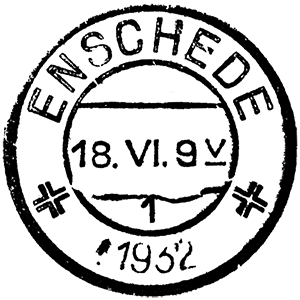 Several pieces of mail failed to receive the arrival stamp, and upon request of the senders or receivers, were later stamped with a red version of the arrival stamp. 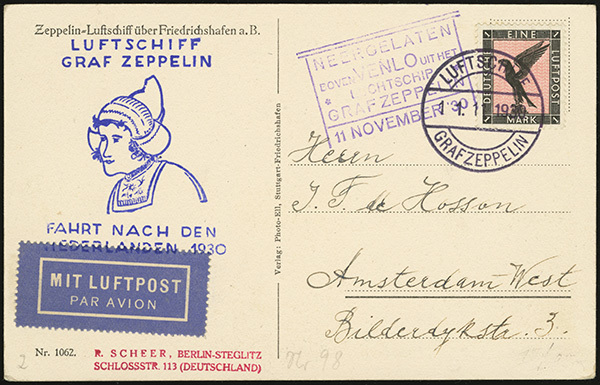 Return mail received a Venlo confirmation stamp similar to the arrival stamp, but with different wording. 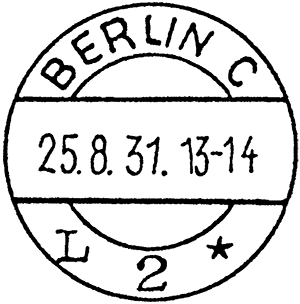 This is stamp MiNr 364 X on postcard. 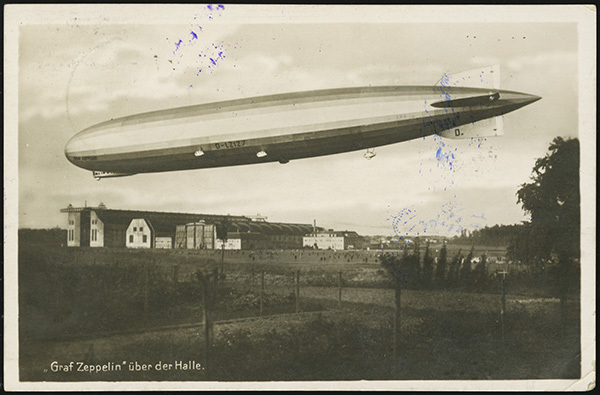 It was canceled at Friedrichshafen on 10 November 1930, and dropped at Venlo on 11 November 1930. It catalogs as Sieger 98 Aa, Michel 150 a, and Frost 127-97 Aa. Here it is mounted in the album. 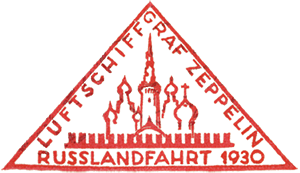 This is stamp MiNr 382 on postcard. 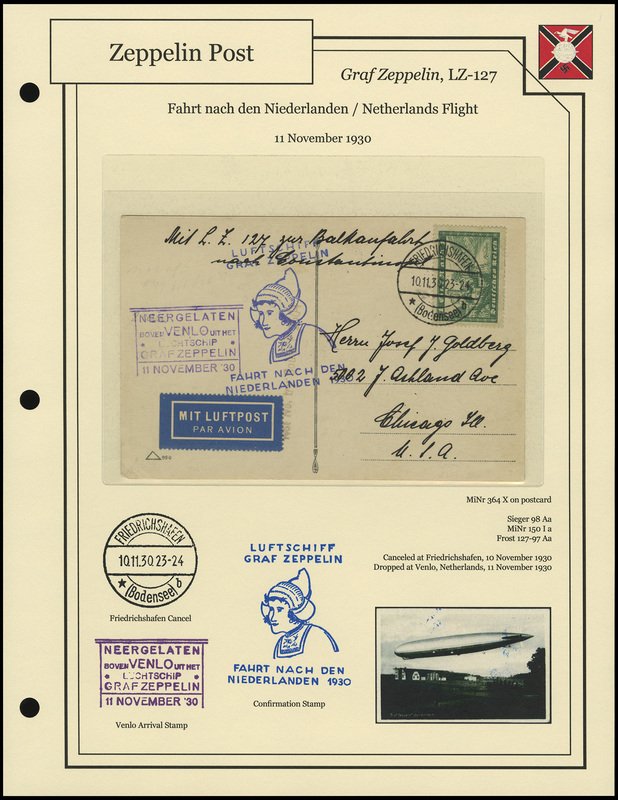 It was canceled on board on 11 November 1930, and dropped at Venlo on 11 November 1930. 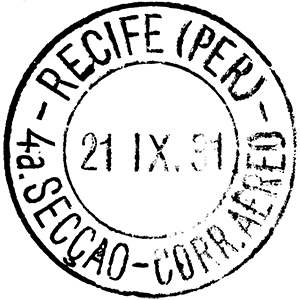 It catalogs as Sieger 98 Ab, Michel 150 c, and Frost 127-97 Ac. Here it is mounted in the album. Next up, the 1932 Fahrt nach den Niederlanden (Flight to the Netherlands). 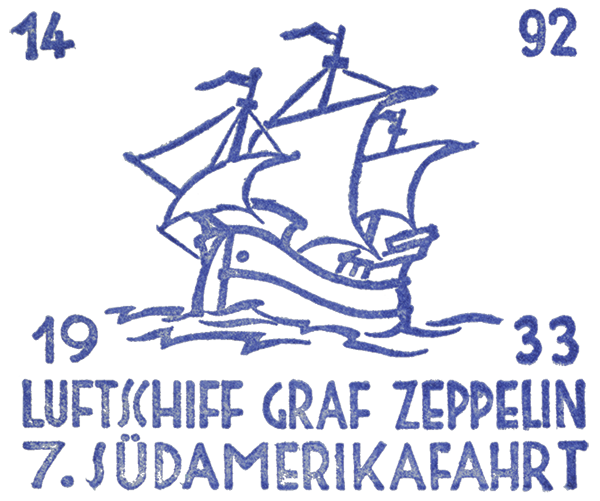 On 18 June 1932, the Graf Zeppelin (LZ-127) flew from Friedrichshafen to the Netherlands, then returned the following day. 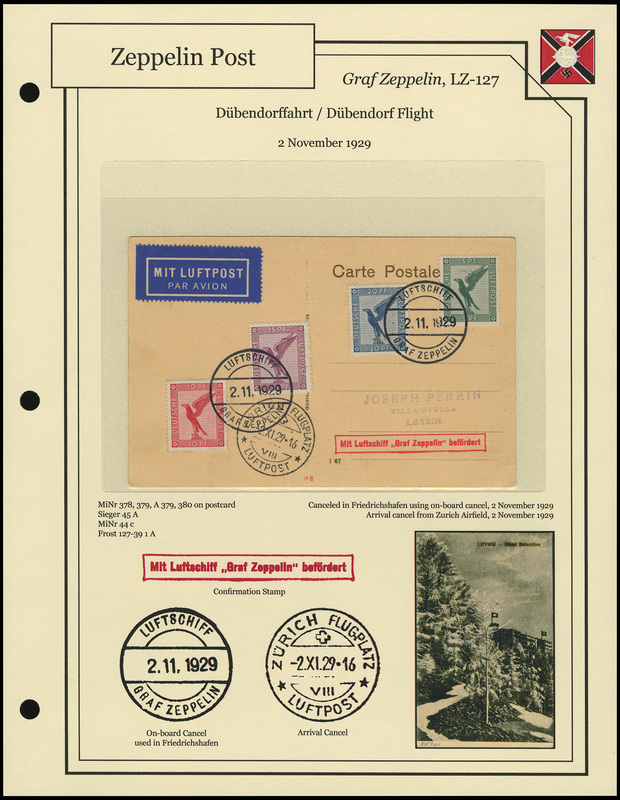 Friedrichshafen cancel is an example from an earlier flight. 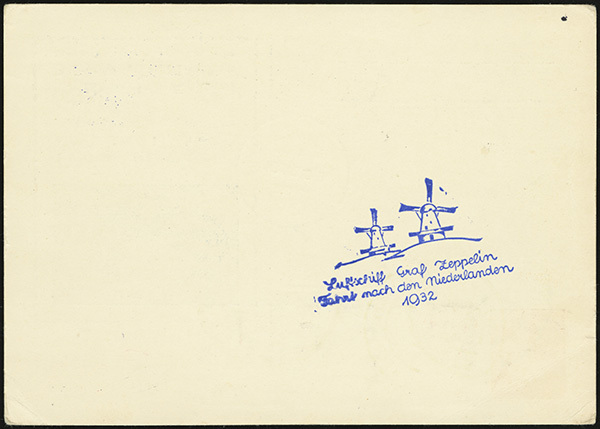 The LZ-127 first stopped at Enschede, where mail was dropped and taken on board. After exchanging mail at Enschede, the LZ-127 flew to Rotterdam, dropping mail at Groningen en route. The LZ-127 departed Rotterdam late on 18 June 1932, arriving back in Friedrichshafen in the early hours of 19 June 1932. 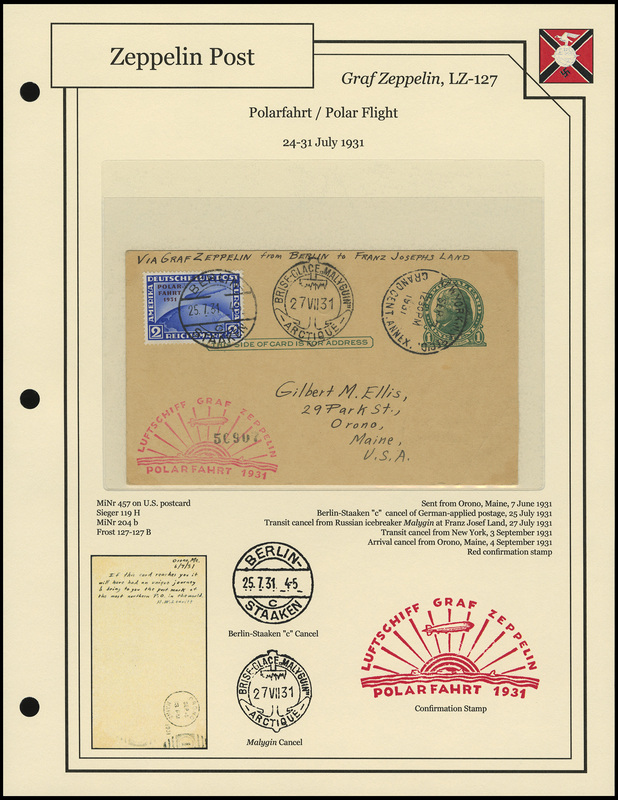 This is postcard MiNr P180 I, Borek 179 a bearing stamps MiNr 379 and A 379. 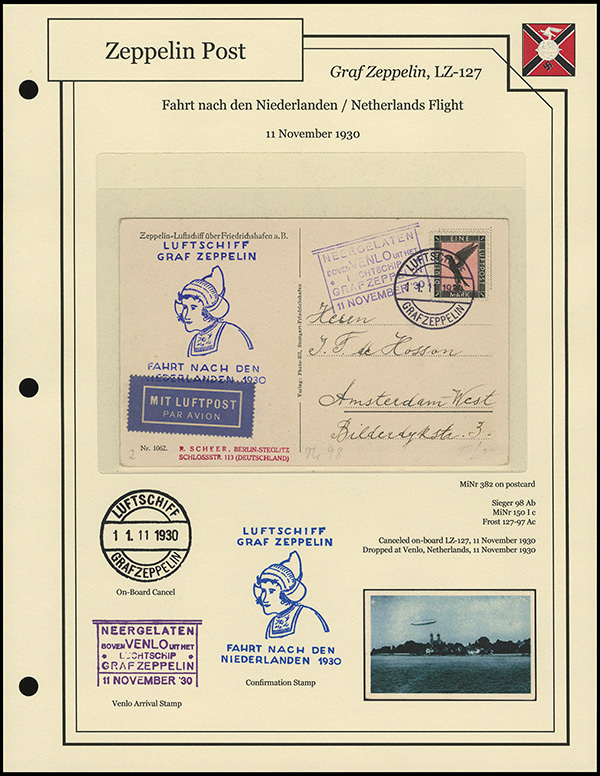 It was canceled at on board on 18 June 1932, and dropped at Enschede the same day. 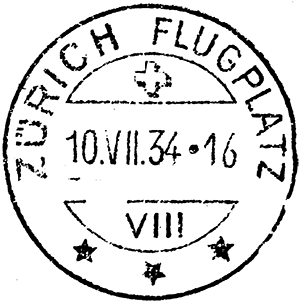 It catalogs as Sieger 164 Ab, Michel 247 b, and Frost 127-151 1.B. Here it is mounted in the album. 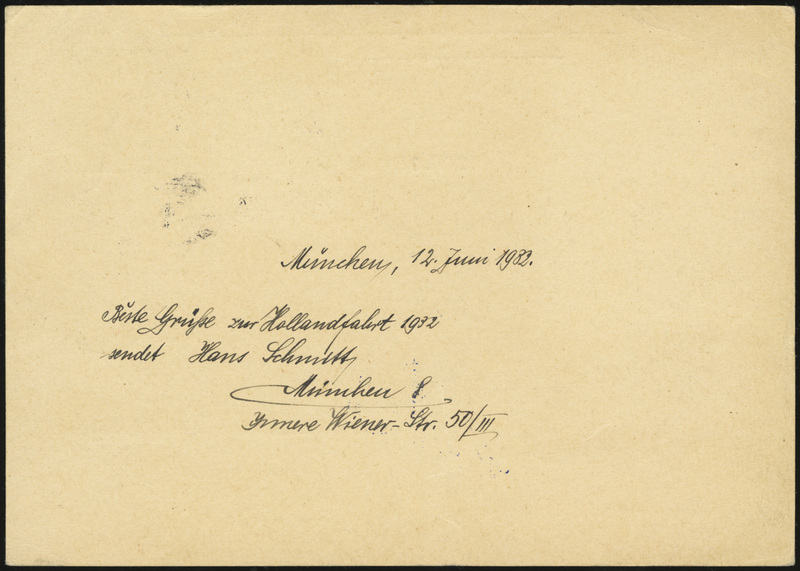 This is postcard Frech PP 106 B16/04, Borek 87/B 6 bearing stamps MiNr 379, A 379, and 381. It was canceled on board on 18 June 1932, and dropped at Groningen the same day. 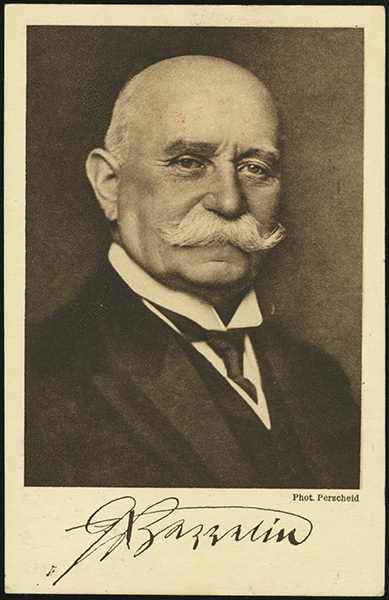 It catalogs as Sieger 164 Bb, Michel 248 I b, and Frost 127-151 2.Cb. Here it is mounted in the album. 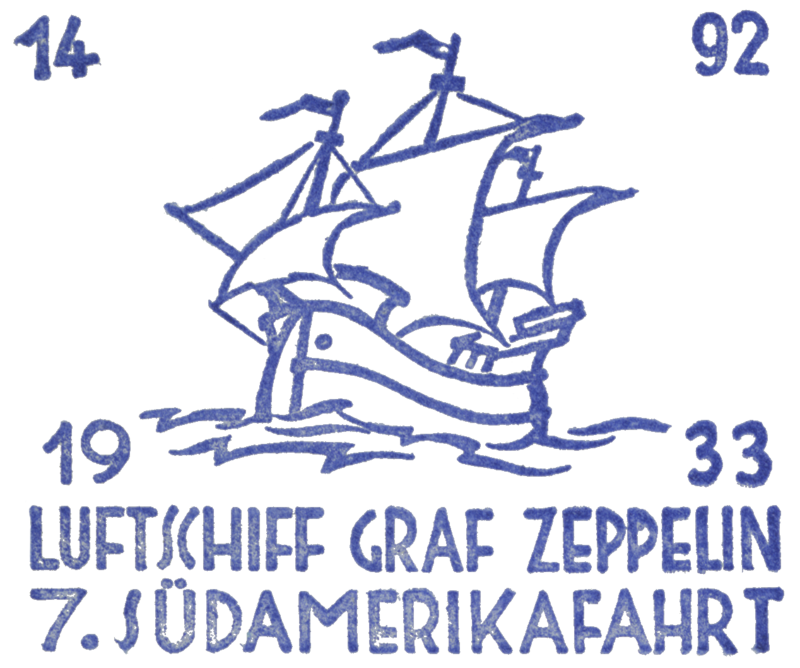 Next up, the 7th Südamerikafahrt (South America Flight) of 1933. On 16 September 1933, the Graf Zeppelin (LZ-127) departed Friedrichshafen on its seventh Südamerikafahrt (South America Flight) of 1933. 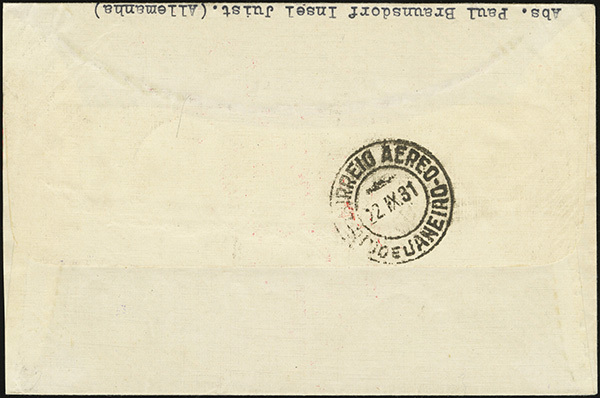 It arrived in Recife, Brazil, on 19 September 1933, then proceeded to Rio de Janeiro, arriving on 21 September 1933. 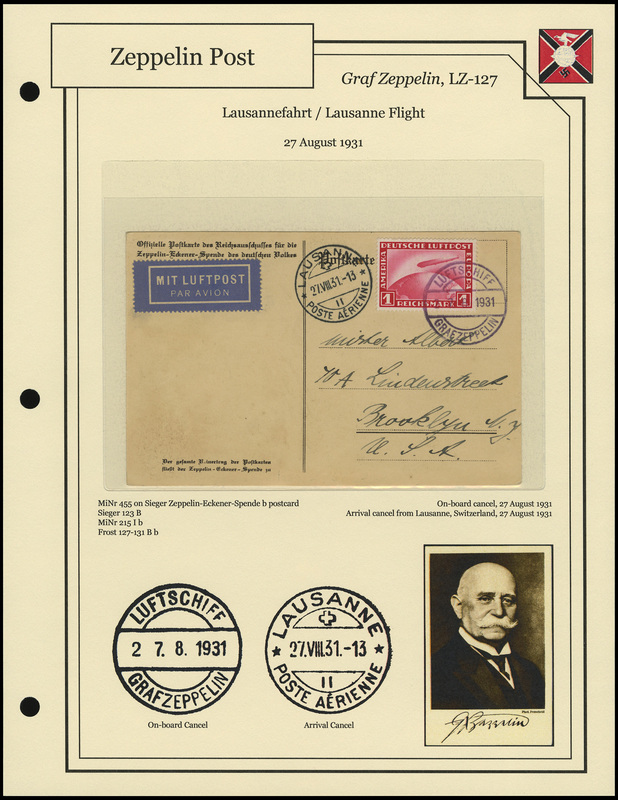 The same day, it began its return flight to Friedrichshafen via Recife and Seville, Spain. All mail carried a blue confirmation stamp commemorating the flight. Mail from Germany generally had either a Friedrichshafen, Berlin, or on-board cancel. 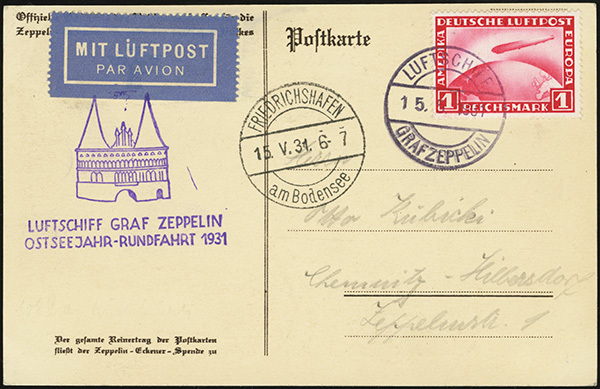 Mail postmarked in Berlin also carried a red confirmation stamp for the flight. And here it is on the album page. 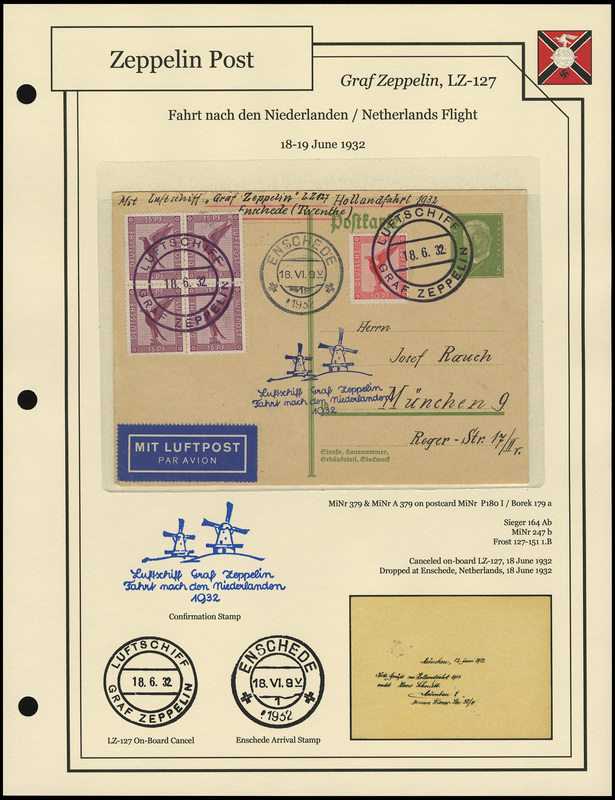 Here's another copy of Sieger 164 B b from the 1932 Niederlandefahrt that I received in the mail today. 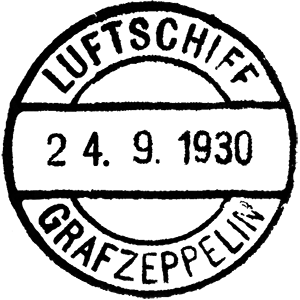 On 9 September 1930, the Graf Zeppelin (LZ-127) departed Friedrichshafen for Moscow. It arrived on 10 September 1930, and stayed for only a few hours before beginning its return voyage to Friedrichshafen. 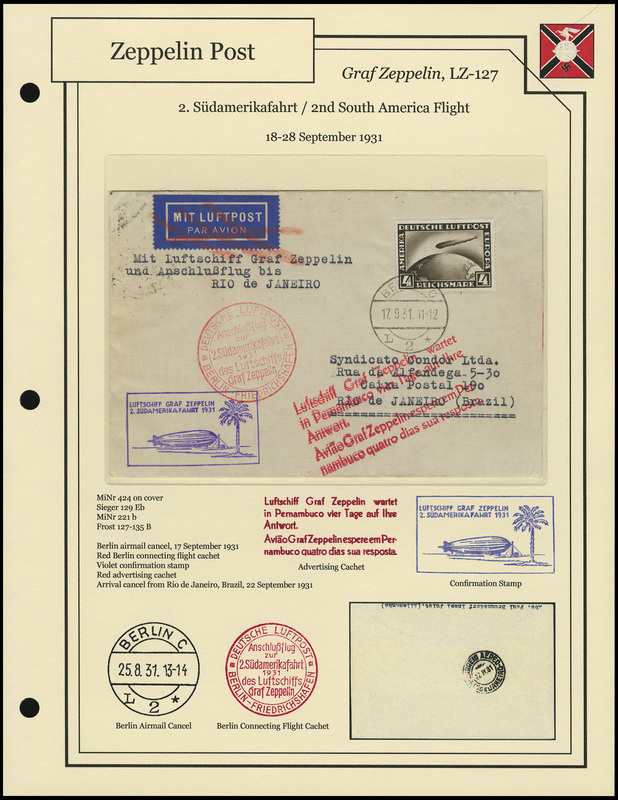 It arrived in Friedrichshafen on 11 September 1930. 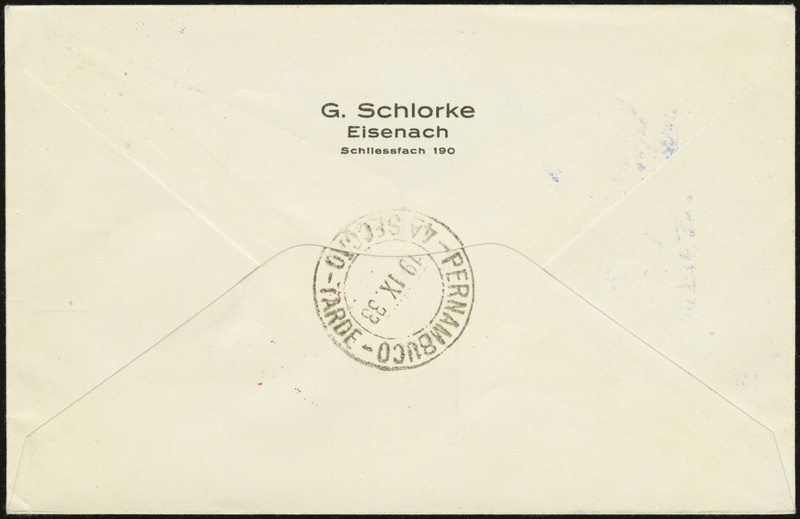 Outbound mail can be found with Friedrichshafen cancels or on-board cancels dated 9 or 10 September 1930, and should carry a red confirmation stamp. 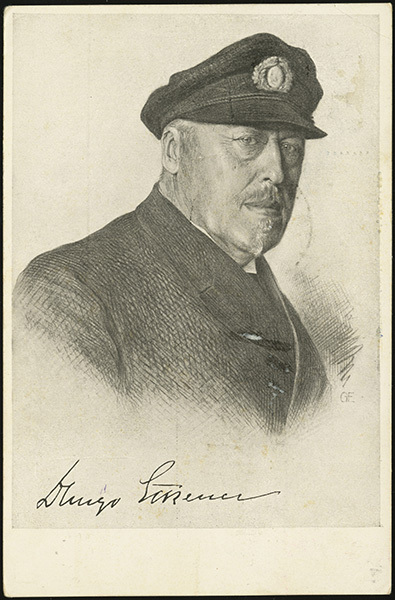 This postcard was mailed on-board on 9 September 1930. It was canceled in Moscow upon arrival and on re-loading for the return voyage. Finally, it received a Berlin arrival cancel at the end of its long journey. 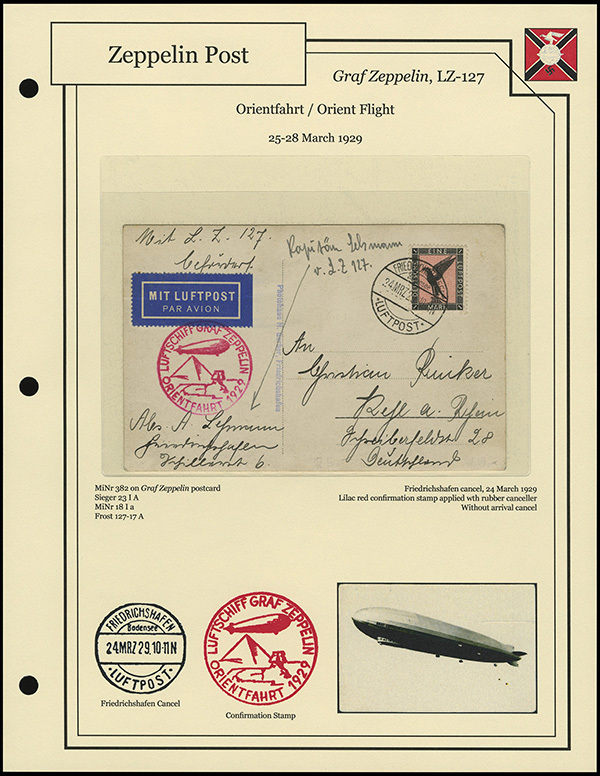 Return mail frequently bears a commemorative Russian stamp and a Russian zeppelin confirmation cachet. 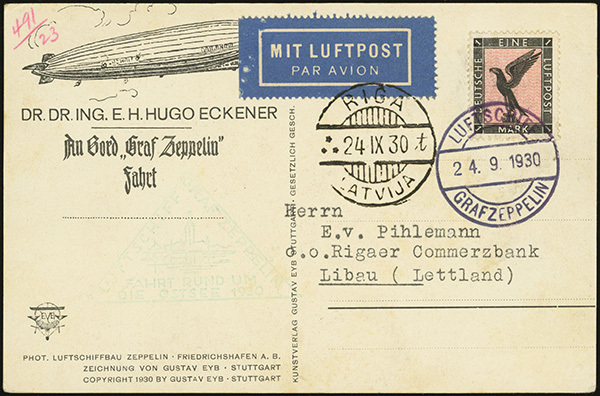 On 30 June 1931, the Graf Zeppelin (LZ-127) departed Friedrichshafen for a flight to Reykjavik, Iceland, and back. 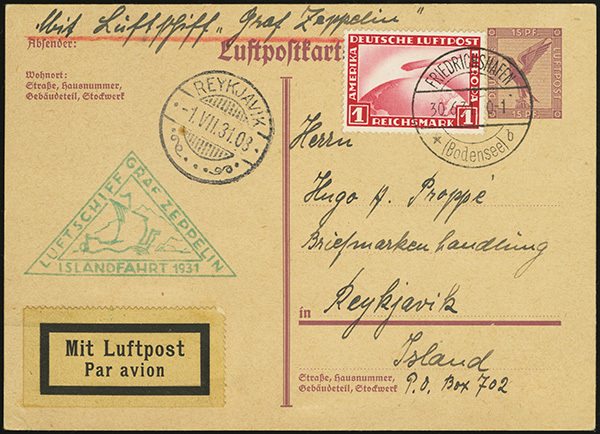 Mail was exchanged in Reykjavik, and the Graf Zeppelin returned to Friedrichshafen, arriving on 3 July 1931. 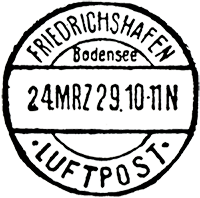 A green Islandfahrt confirmation stamp denotes mail that was transported on the flight. 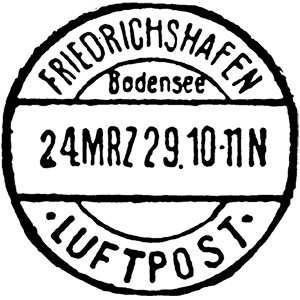 Outbound mail typically bears a Friedrichshafen or on-board cancel. 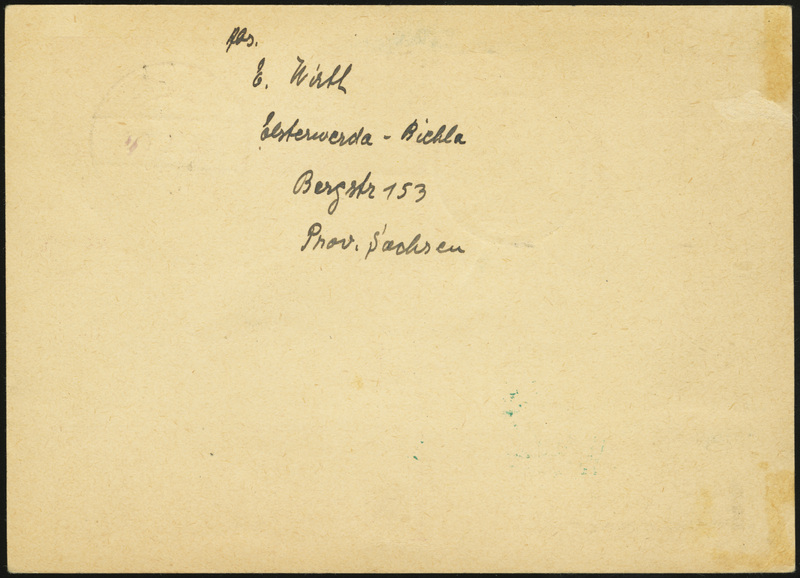 Mail dropped in Reykjavik should bear a Reykjavik arrival cancel. 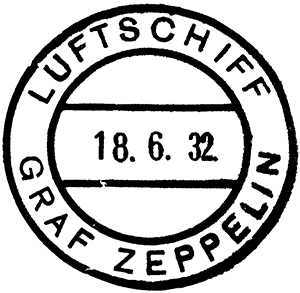 Three types of arrival cancels can be found. 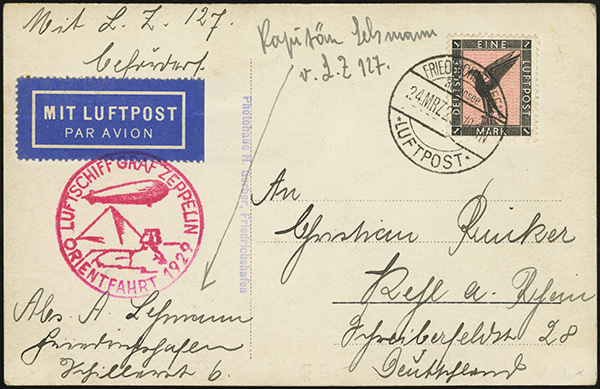 This postcard was postmarked in Friedrichshafen on 30 June 1931, and dropped in Reykjavik on 1 July 1931. Icelandic mail on the return voyage typically features Icelandic stamps overprinted “Zeppelin / 1931” which were issued only for use on this flight. 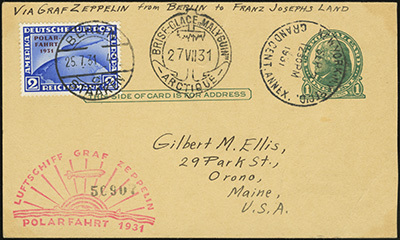 Are those stamps just regular Airmail Stamps or did the Zeppelin Mail require special postage? Sorry. I didn't see your question when you originally posted it. 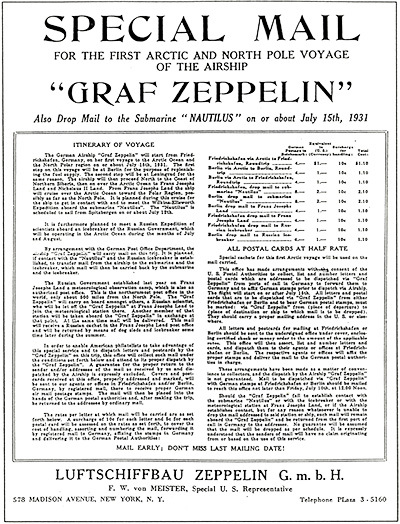 In general, any postage could be used on zeppelin mail, as long as it paid the required rate. From 25-28 March 1929, the Graf Zeppelin (LZ-127) made a round-trip flight from Friedrichshafen to the Levant and back. 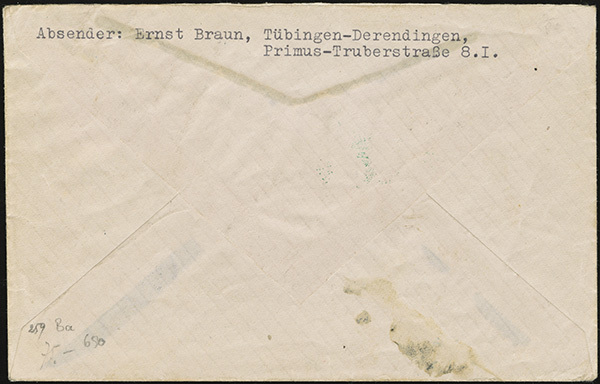 Mail carried on-board typically bears cancels from either Friedrichshafen, or from the on-board canceller. Mail carried on the flights bears an Orientfahrt confirmation stamp. 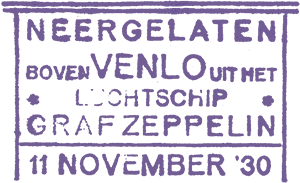 Two versions exist — one applied in red-lilac ink with a rubber canceller, and one in cinnamon red ink applied with a steel canceller. 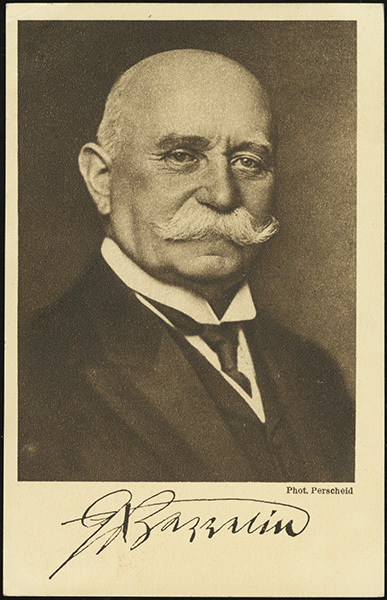 They can be distinguished by the thickness of the canceller strike (rubber is thick, steel is thin), and on the rubber canceller version the front of the airship touches the "P". 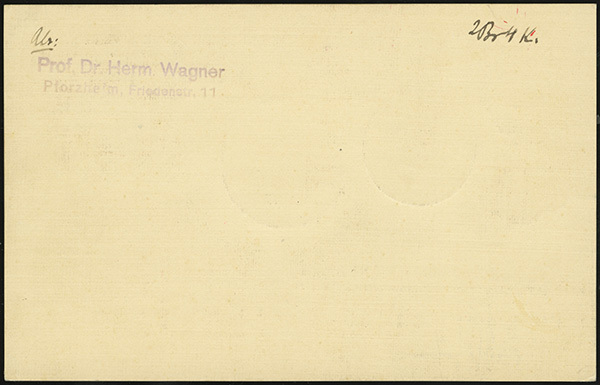 One official mail drop was made at Er Ramle, though only a fraction of the dropped ail received an Er Ramle arrival backstamp. 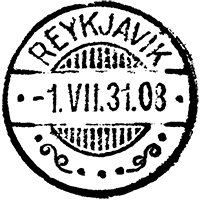 Unofficial drops were made along the route in Athens, Rome, Spit, Vienna, and Munich. 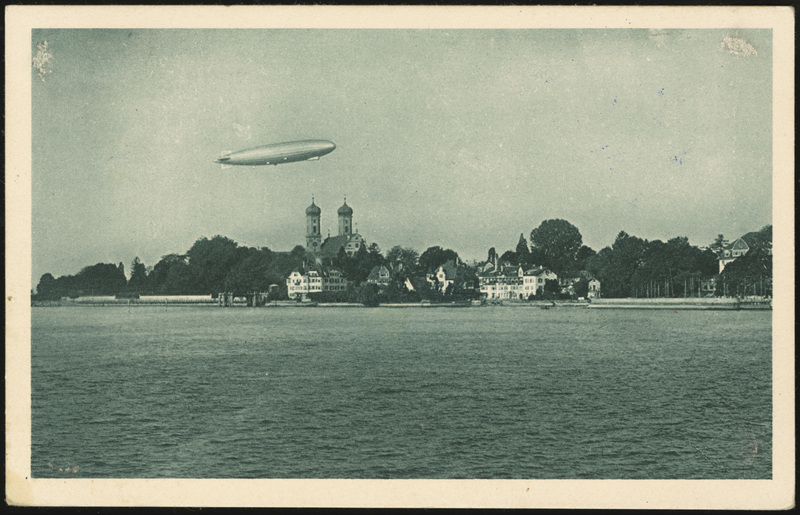 On 16 May 1929, the Graf Zeppelin (LZ-127) departed Friedrichshafen for its first America Flight of 1929. 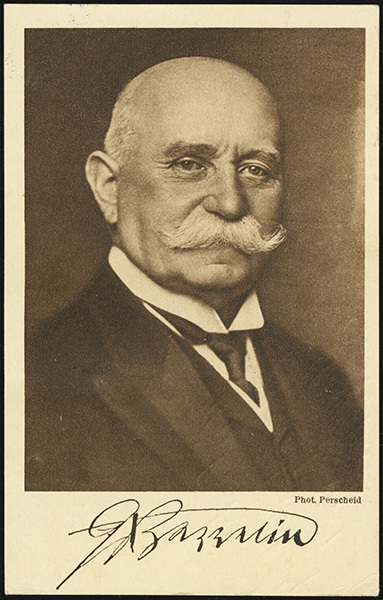 The following day, 17 May 1929, the airship diverted to Toulon-Cuers, France, due to engine trouble. 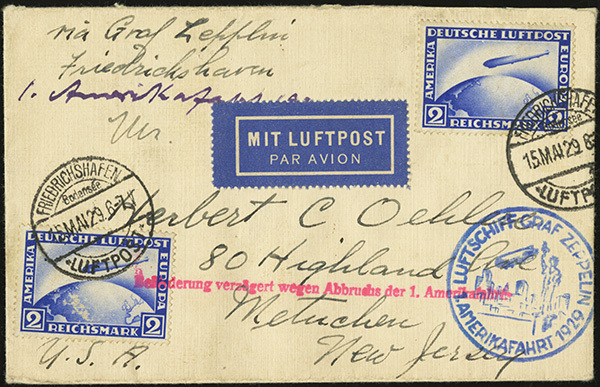 The flight to America was cancelled, and the mail carried on-board was held until the flight could be resumed. 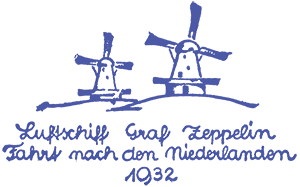 A cachet was added noting that the flight was interrupted. 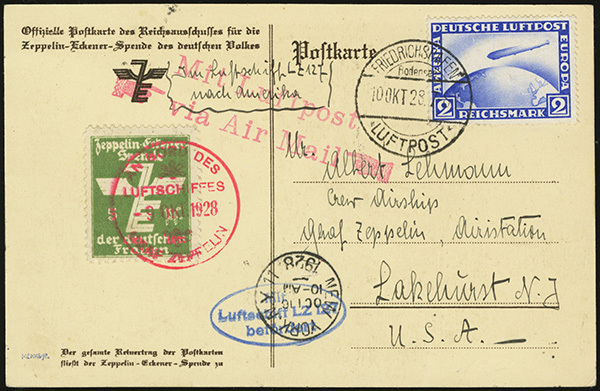 The flight resumed on 1 August 1929 from Friedrichshafen, arriving at Lakehurst, N.J., on 5 August 1929. 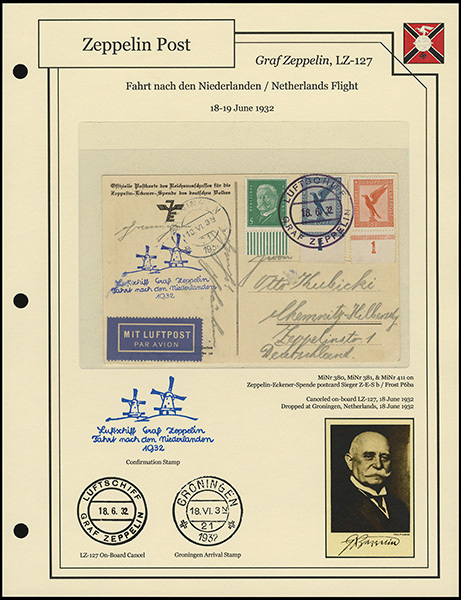 Mail carried on both the original flight and the resumed flight carried a blue confirmation stamp. The cover shown below was part of the original flight, as you can tell from the cancel date (15 May 1929) and flight interruption cachet. 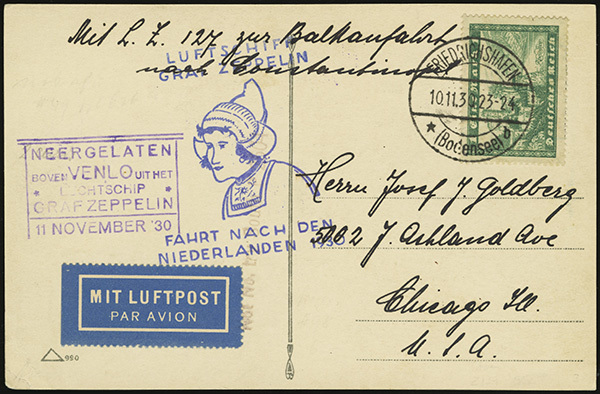 It bears an arrival cancel from New York, 5 August 1929. 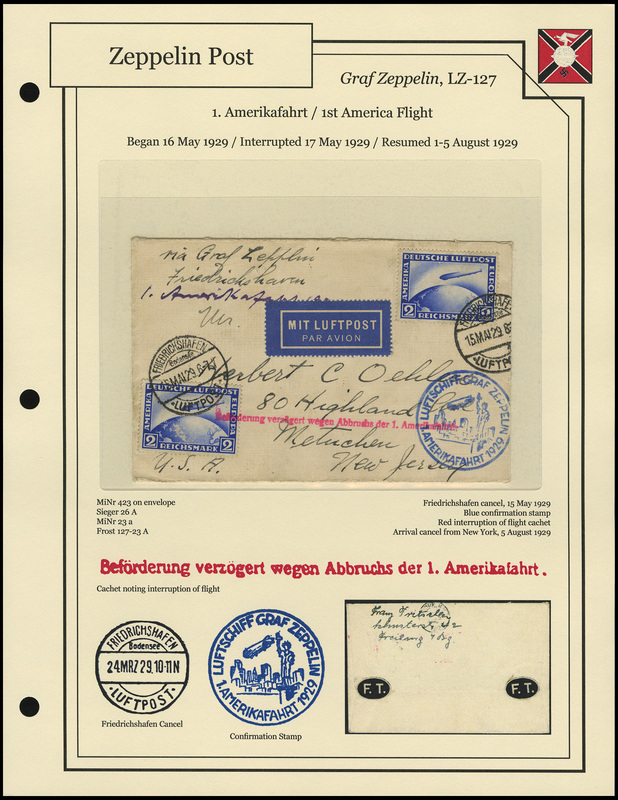 The LZ-127 departed Lakehurst for Friedrichshafen on 7 August 1929, but the return flight is not considered part of the 1st America Flight of 1929. 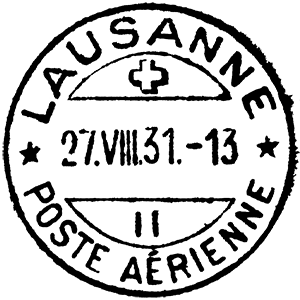 Rather, it was the first leg of the 1929 Round-the-World Flight (Lakehurst-Friedrichshafen-Tokyo-Los Angeles-Lakehurst-Friedrichshafen). 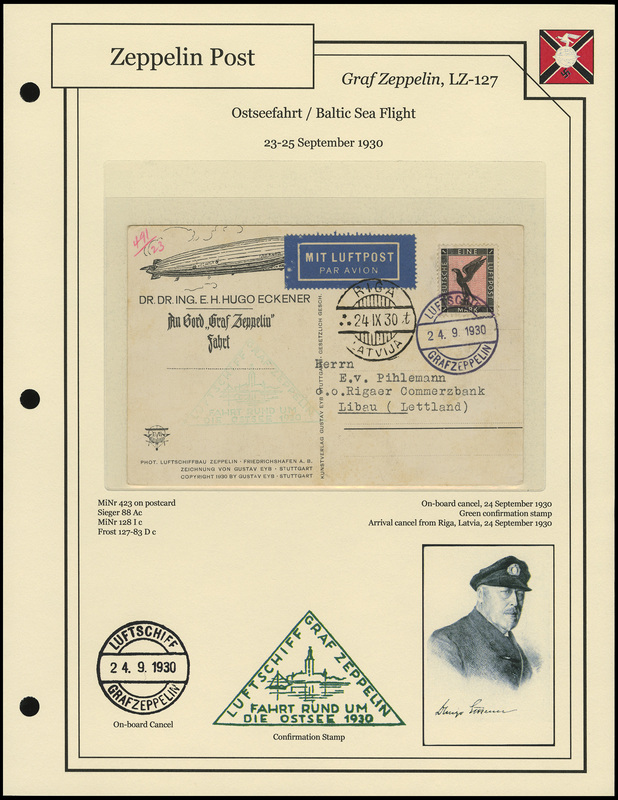 From 23-25 September 1930, the Graf Zeppelin (LZ-127) completed a trip around the Baltic Sea. 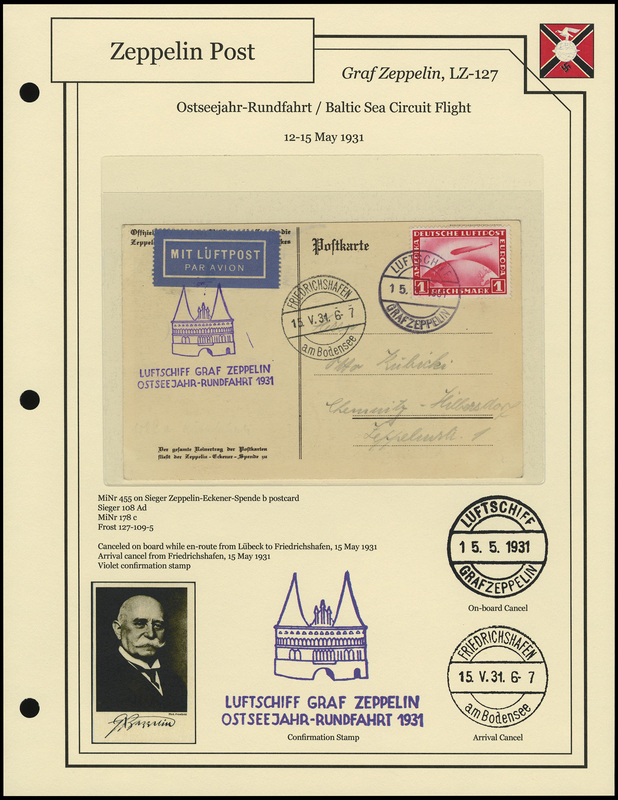 The flight departed Friedrichshafen on 23 September 1930, then stopped at Berlin, Riga, Tallinn, Helsinki, and Stockholm, before finishing the flight with a second landing in Berlin. 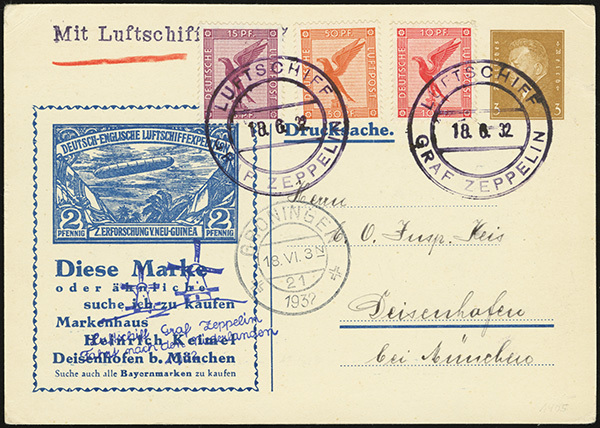 Mail carried on board typically has one of three cancels — Friedrichshafen, Berlin, or on-board. All mail carried on the flight received a green confirmation stamp. 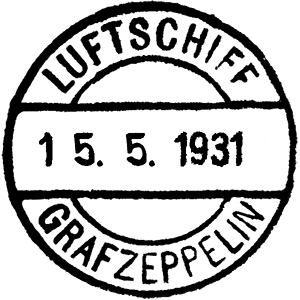 On 24 July 1931, the Graf Zeppelin (LZ-127) departed Friedrichshafen on a lengthy journey to the Arctic. 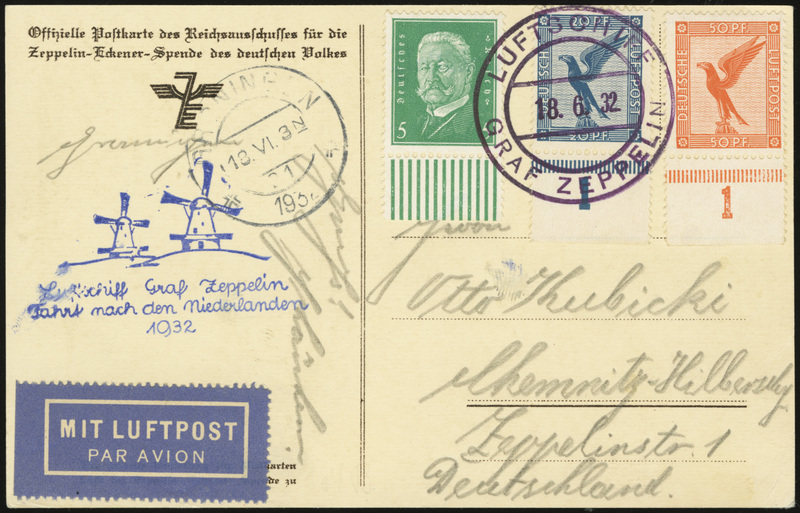 The Graf Zeppelin stopped in Berlin, taking on a large quantity of mail, including mail from around the world which had been mailed to Berlin specifically for loading on the flight. Mail from treaty countries could be franked with stamps from that country. 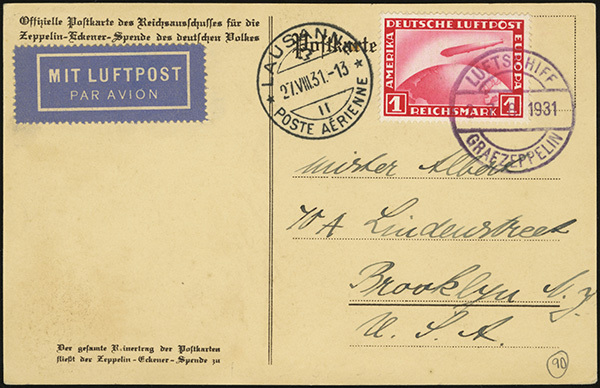 For mail from non-treaty countries, German postage was added and canceled with one of two Berlin-Staaken cancels. 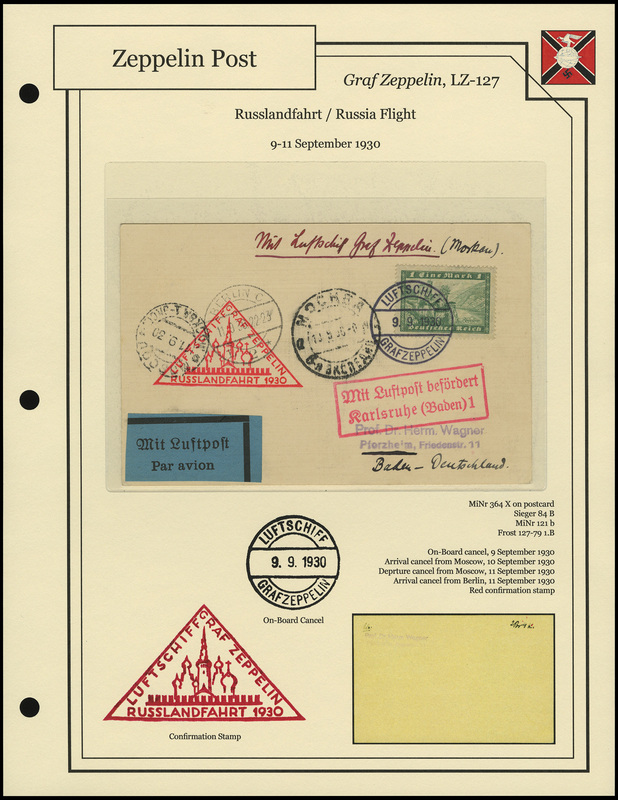 The flight then proceeded from Berlin to Leningrad, where mail was dropped, and additional Russian mail was taken on board. 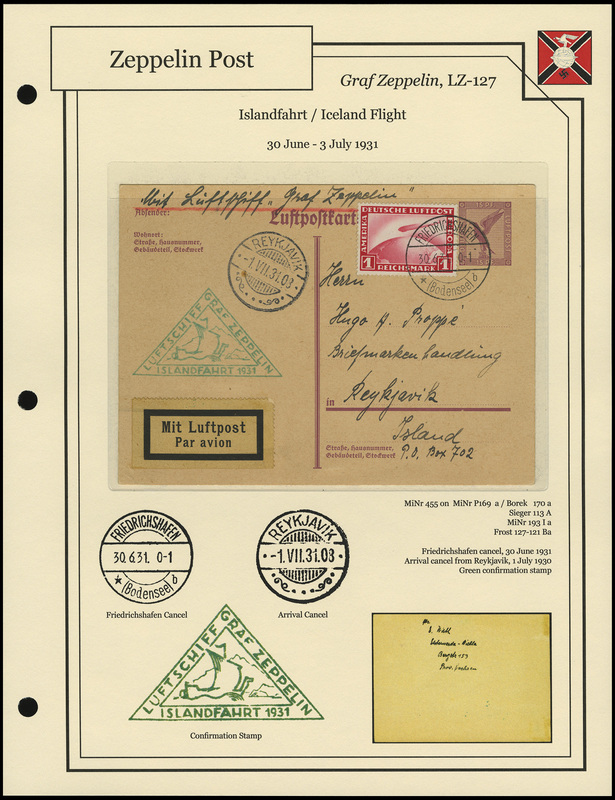 The LZ-127 then flew to Franz Josef Land, where it landed on the ice and delivered mail to the Russian icebreaker Malygin. 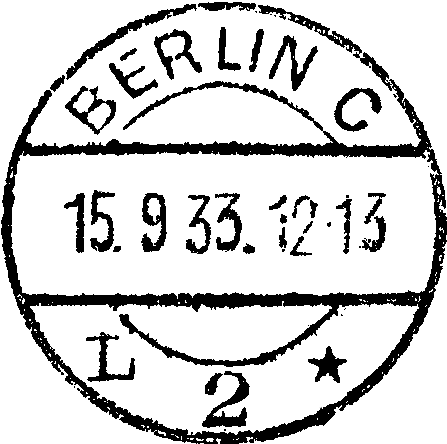 Mail dropped at the Malygin received a transit cancel from the ship. 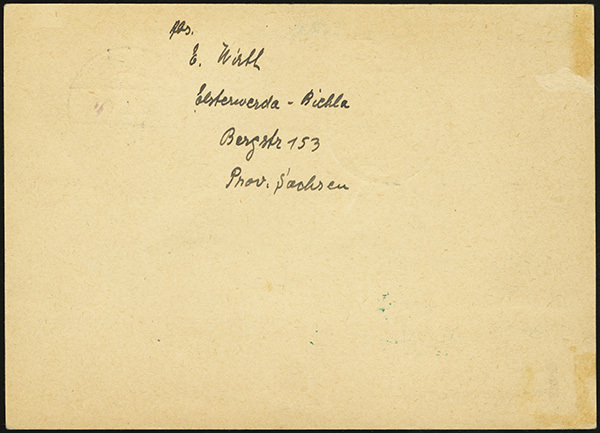 Mail dropped at the Malygin was then transported via icebreaker or dogsled back to land, where it was then forwarded to the addressees around the world. 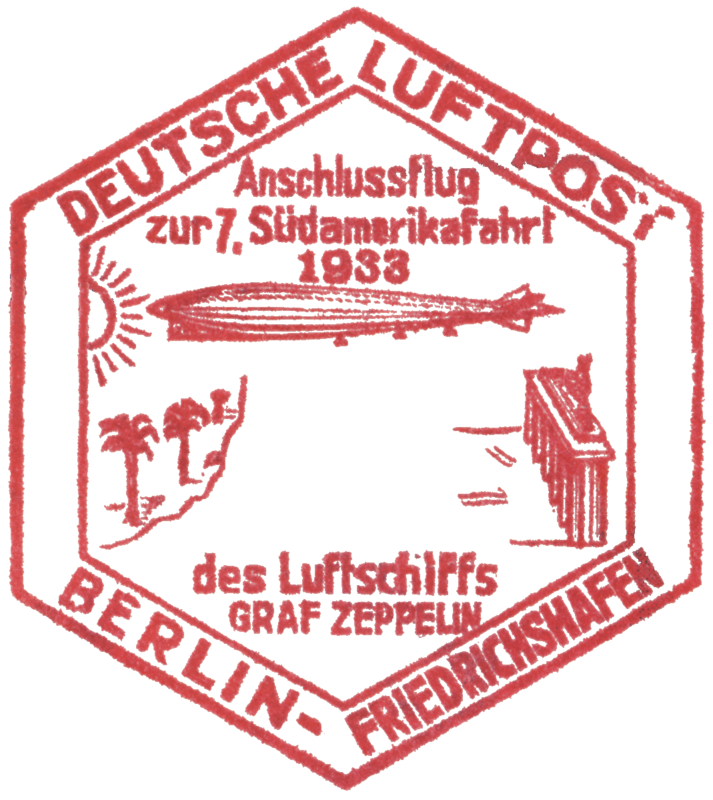 Mail transported on the flight, whether from Friedrichshafen, Berlin, or on-board, received a red Polarfahrt confirmation stamp. 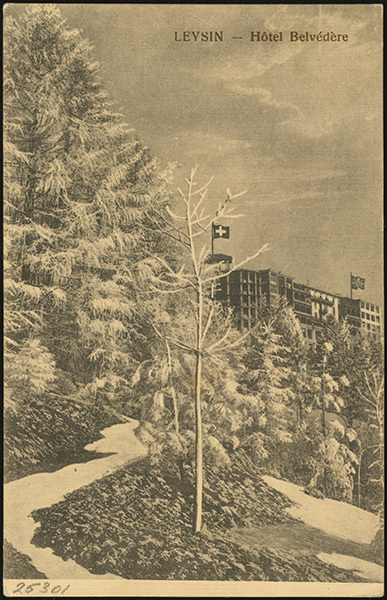 This postcard was mailed from Orono, Maine, to Orono, Maine, via Orono-Berlin-Leningrad-Malygin-New York-Orono. 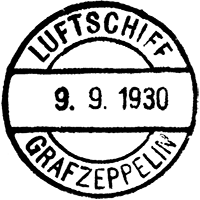 On 27 August 1931, the Graf Zeppelin (LZ-127) made a round-trip flight from Friedrichshafen to Lausanne, Switzerland, and back. Mail carried on board bears either a Friedrichshafen or on-board cancel. 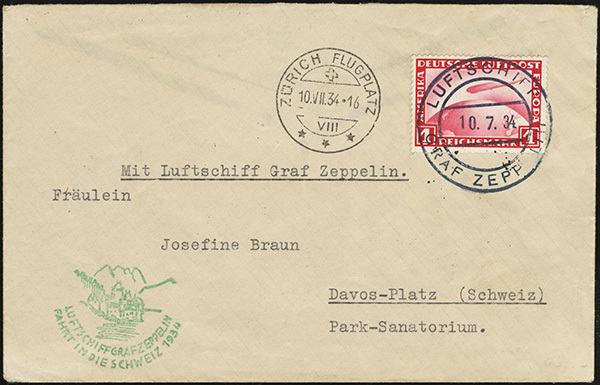 Mail dropped at Lausanne bears a Lausanne arrival cancel. 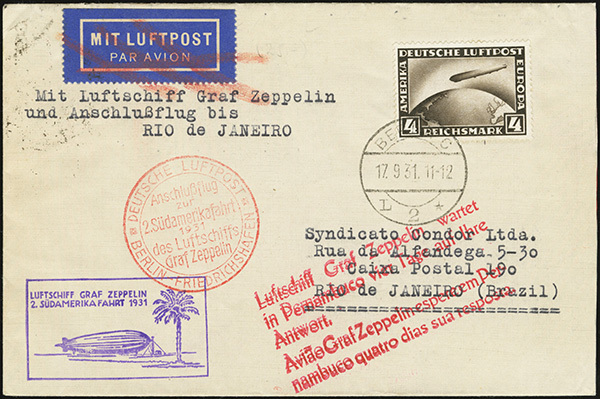 On 18 September 1931, the Graf Zeppelin (LZ-127) departed Friedrichshafen for Recife, Brazil, on its second South America flight of 1931. 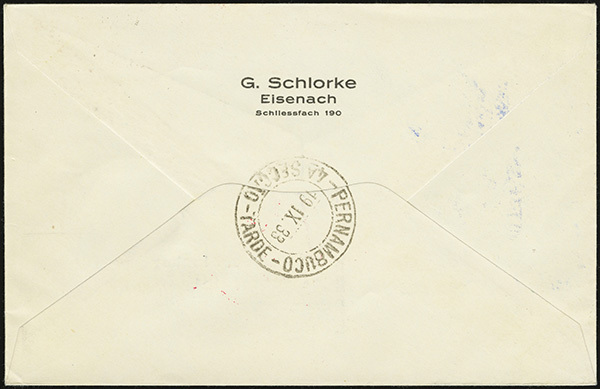 Mail transported typically carries a cancel from either Friedrichshafen or on-board. The airship arrived in Recife on 20 September 1931. 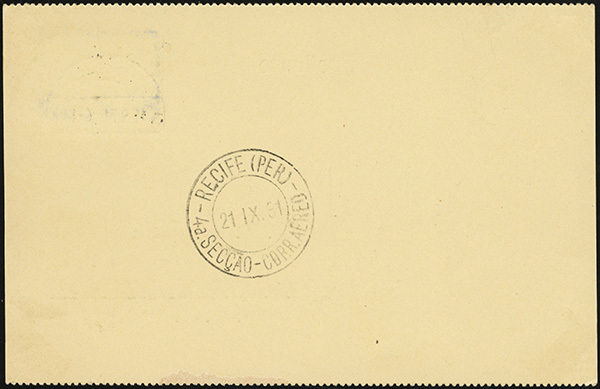 Mail dropped in Recife bears a Recife arrival cancel dated 21 September 1931. All mail carried on the flight received a violet confirmation stamp. 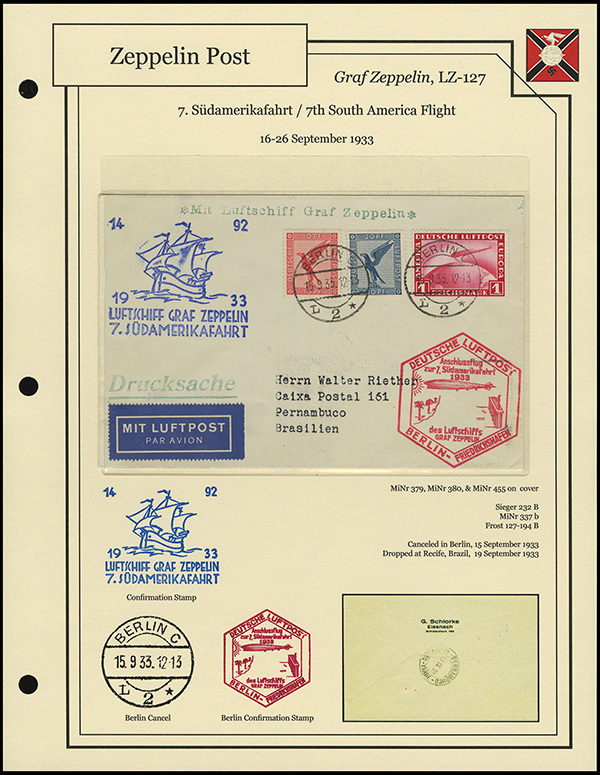 The flight departed Recife on 25 September 1931 for its return to Friedrichshafen, arriving on 28 September 1931. 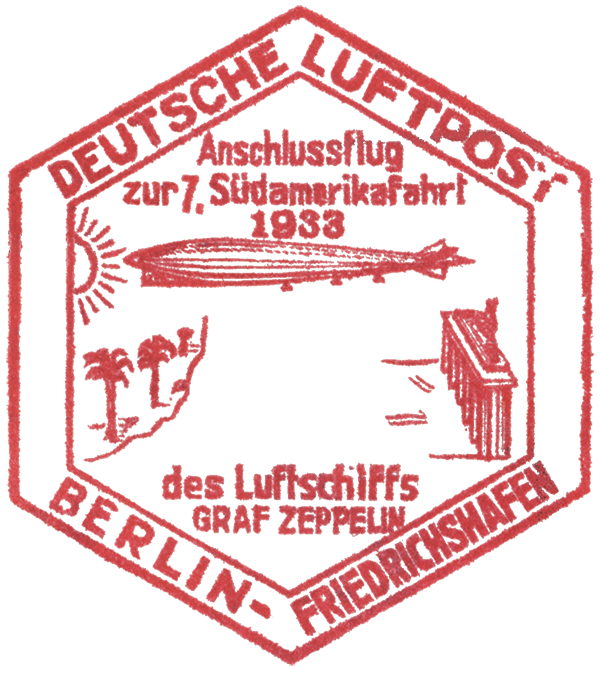 On 2 November 1929, the Graf Zeppelin (LZ-127) made a round-trip flight from Friedrichshafen to Dübendorf, Switzerland, and back. Mail carried on the flight can contain one of several cancels. 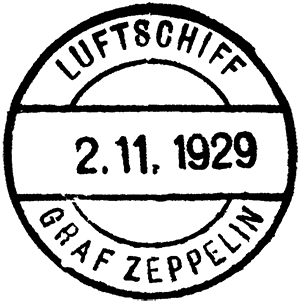 The most common are a Friedrichshafen cancel, an on-board cancel, or a cancel made with a previous version of the on-board cancel which had been retired from on-board use but was still used in Friedrichshafen. All mail carried on the flight bears a red confirmation stamp. Mail dropped in Dübendorf bears a Zurich arrival cancel. 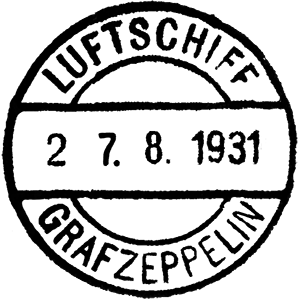 From 10-12 July 1934, the Graf Zeppelin (LZ-127) conducted a series of flights between Friedrichshafen and Zurich, Switzerland. 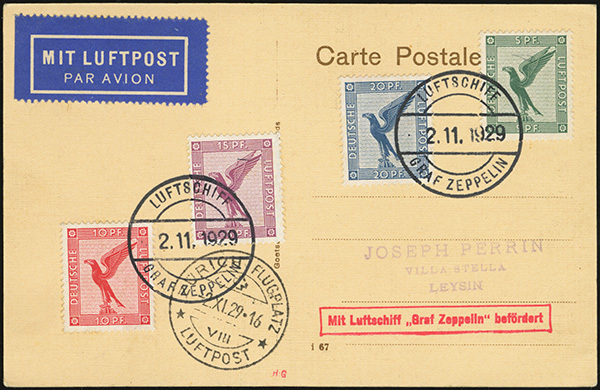 The first flight on 10 July 1934 was a round-trip from Friedrichshafen with only a mail drop in Zurich. Mail carried on this flight can be found with Friedrichshafen or on-board cancels. 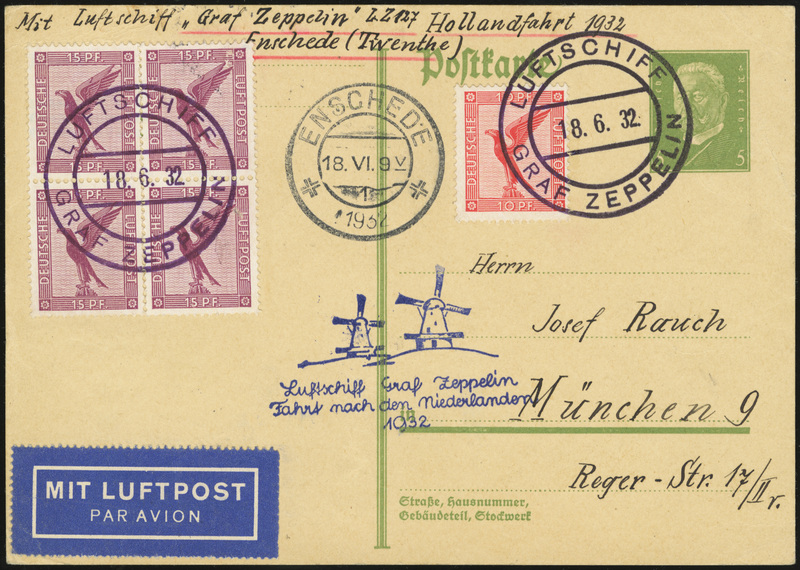 Mail from this first flight bears a Zurich airport arrival cancel. 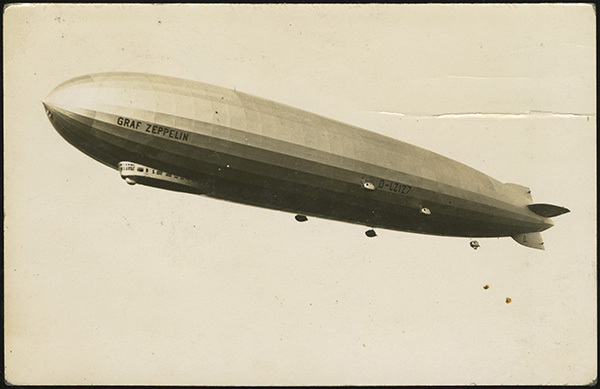 Following its return form the first 10 July 1934 round-trip, the Graf Zeppelin made another round trip on the evening of 10 July, a round trip on 11 July, and two round-trips on 12 July. Mail on these final four flights can only be found with on-board cancels. 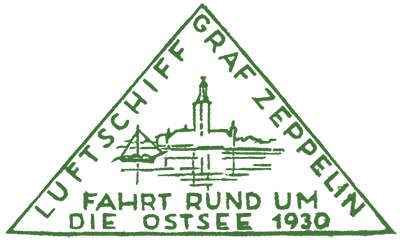 All mail carried should also bear a green confirmation stamp. Here's another cover from the 2nd South America Flight of 1931 (for background, see previous post here). 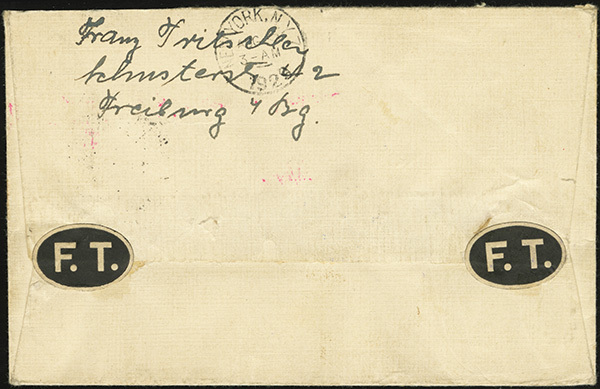 This cover has a Berlin airmail cancel, MiNr D 4-07/a. 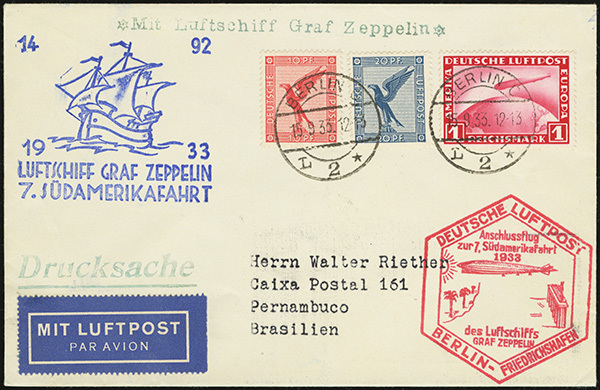 Mail which arrived at Friedrichshafen via the Berlin connecting flight received a red connecting flight cachet. This cover also bears the standard violet confirmation cachet for this flight. 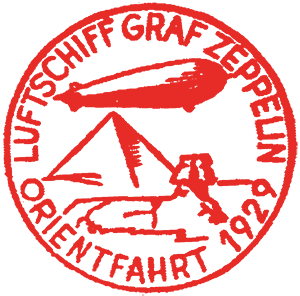 Additionally, much of the mail carried on this flight was stamped with a red advertising cachet. 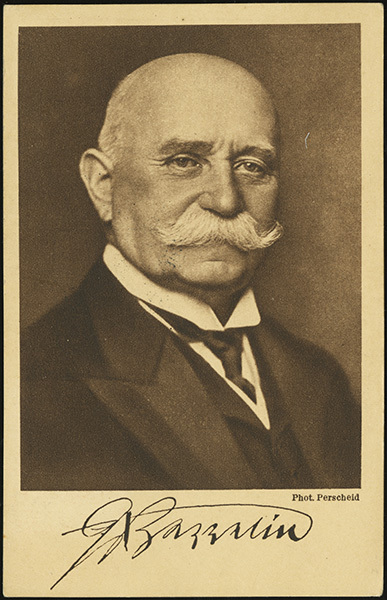 The text translates roughly as "the airship Graf Zeppelin waits four days in Permambuco for your answer." Mail can be found with origin cancels from Friedrichshafen, on board, and various treaty states. 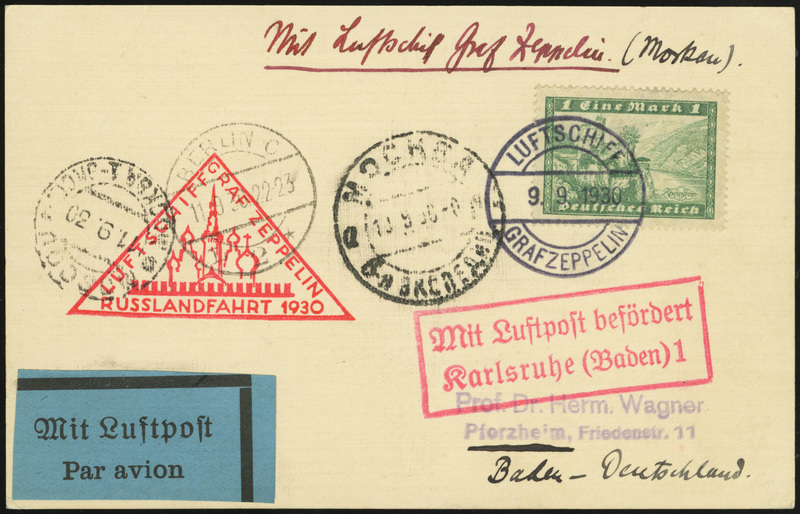 Mail dropped at the final stop in Friedrichshafen is marked with a Friedrichshafen arrival cancel. Mail transported on the flight carries a violet confirmation stamp. Oh my! What a great collection!